A massive win for the Cats set up by a dominance inside (clearances 4323), as well as outside (kicking efficiency 75 to 53 percent). The Suns missing a host of players were unable to compete the longer the game progressed. Lachie Henderson having a strong game with 21 disposals at 93 percent efficiency, and a gamehigh nine intercept possessions for the Cats, with four of these intercepts launching scores. Geelong now lead in forward 50 marks (233) and Tom Hawkins making the most of the absence of May and Thompson tonight has taken seven of these marks, and equalled a career best 22 disposals. The Suns finally break the Geelong streak of 18 consecutive scores. Gold Coast has now had 42 chains starting in the defensive 50 that have resulted in just six forward 50 entries and a score of 1.0.(6). The Cats with the first four clearances to start the final quarter, and seven of the first eight forward 50 entries, and the Cats set to gain a massive percentage boost from this match. Gold Coast has only five players that have had five or more effective kicks. Geelong has only five players that have not had five or more effective kicks. The final quarter starts ominously for Gold Coast, with another clearance from the Cats leading to another goal. Geelong has now scored 4.2. (26) from centre bounce clearances. Another dominant quarter from the Cats who have now had the last 13 scores in the game. They won the clearances (113) and contested possessions (35-26) allowing the game to be again played in their front half. Gold Coast with many of its best players missing has relied too heavily on too few. Only Ablett (11) and Hall (11) have had more than six contested possessions (the Cats have six such players). These two players also have 10 of the Suns 18 clearances. Geelong has a big advantage in forward 50 entries (4324), but once the ball is in there the Cats lead forward 50 marks (18-3) and forward 50 tackles (16-4). Geelong now has the last 10 scores in the match for a return of 4.6.(30). The injury depleted Gold Coast has marginally improved its kicking efficiency this quarter to 60 percent, but the Cats have had 43 effective kicks to the Suns 15 this quarter. Both teams have generated two goals from chains starting in the defensive half. The Cats dominance at clearances (have now won the last ten) has resulted in the ball being in their forward half where the Suns turnovers are being punished. Both teams are converting 100 percent of inside 50 entries to start the third quarter. Unfortunately for the Suns, the Cats have generated eight forward 50 entries, for a score of 4.4. (28), to the Suns 1.0. (6) from one forward 50 entry. Geelong has won the first four clearances to start the third quarter, and lead in inside 50 entries (61) as the game continues to be played completely on its terms. 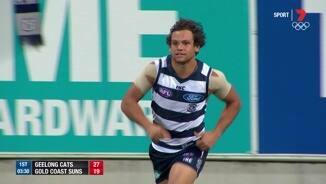 Geelong with a seventh goal from a forward half intercept. The Suns have conceded 10 unforced turnovers compared to Geelong four. Geelong able to immediately answer the Suns with their second goal of the game from a centre bounce clearance. 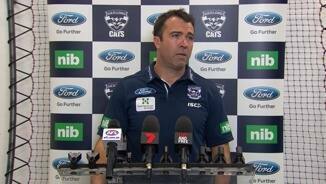 The Cats average 13.8 points per game from this source, and have scored 2.1. (13) tonight from centre bounce clearances. The Suns start the third quarter well applying pressure in the forward 50 to generate their first goal of the game from a forward 50 intercept. Patrick Dangerfield continuing his good start to the season, and at half time leads all players for metres gained (338), contested possessions (10) and inside 50 entries (6). A powerful second quarter from the Cats who dominated all areas resulting in forward 50 advantage (178) and marks inside 50 (9-0). Geelong got on top at the stoppages (clearances 12-6), allowing the game to be played primarily in its forward half. The Cats have been able to get the ball into the hands of the dangerous Steve Motlop, who has equal gamehigh handball receives (9) and uncontested possessions (13), which has lead to 93 percent disposal efficiency and three goals. Geelong has played on immediately after 18 percent of marks this season, which is the lowest percentage of any side, and has also had the third highest kickto-handball ratio. This more cautious method has them leading marks (55-24) tonight. Geelong has now scored 6.2. 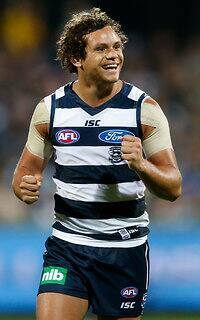 (38) from 14 forward half intercepts, which exceeds the Cats season average of 33.6 points from such a source. The Suns have won 36 percent of oneon-one contests this season (which is ranked first). Tonight the Cats lead in one-one-one contest wins (6-2), and also lead in contested marks (8-2). Geelong starting to dominate at the contest this quarter and lead in contested possessions (2213) and clearances (6-3), which has lead to an advantage in inside 50 entries (11-3). Josh Caddy leads the Cats for both contested possessions (7) and intercept possessions (6), with two of these intercepts launching scores. Geelong able to play the game on its terms early in the second quarter, with the game in its half (five of the first six inside 50 entries). The Cats are then able to score from Gold Coast defensive half turnovers (five such goals). Gold Coast have won the hitouts (179), but Geelong have been able to win first possession at the stoppages (16-10), and now lead in clearances 13-10. Suns InterchangeTrent McKenzie and is possibly out for the game. 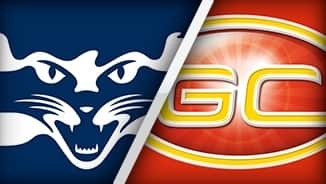 Gold Coast was able to match Geelong at the contest in the first quarter, but the difference in kicking efficiency was stark (82 to 49 percent). Every Cat had an effective kick in the first quarter, whilst nine Suns are yet to have an effective kick. Gary Ablett leads the Suns for clearances (4), contested possessions (5), disposals (11) and score involvements (3). 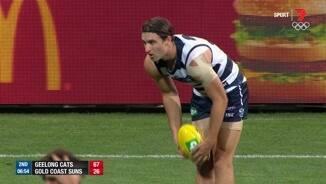 Geelong has punished the Suns defensive half turnovers early in the game with 3.1. (19) from six intercepts. Gold Coast has generated seven forward half intercepts, but only scored 1.0. (6) from these. Gold Coast has been the number one ranked team this season at converting a defensive 50 rebound into a forward 50 entry, with 29 percent success. The Suns have nine chains starting in the defensive 50 today, with none generating a forward 50 entry. Geelong have only two players yet to have an effective kick, while Gold Coast have 13 such players. As a result the overall kicking efficiency of the Cats is 82 percent compared to the Suns 42 percent. After the first four goals in the game came from stoppages, the Cats score a goal from a forward half intercept. Geelong is ranked fifth in scores from such a source with 34.4 points per game. 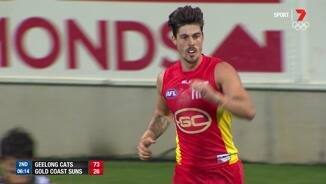 Tom Lynch away to another good start for the Suns. He has now kicked 10 goals in opening quarters this season, which is three more than any other player in the AFL. The Cats score a second goal from a stoppage this time one in the defensive midfield. Geelong is ranked fifth this season in scores from stoppages, averaging 39.4 points per game. The Suns applying good pressure early in the game with 10 of the first 11 tackles, but kicking efficiency of just 46 percent is hurting them. 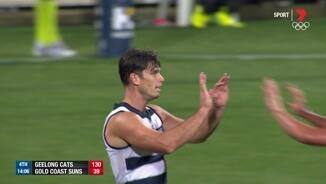 Geelong with the opening goal of the game from a forward half stoppage. The Cats are ranked fifth for such scores with 9.2 points per game. Geelong has won 16 of the first 17 possessions to start the game, with former Cat Gary Ablett the only Sun to touch the ball early. The Cats are the number one ranked team this season for time in forward half differential, with an advantage of ten minutes and 43 seconds per game. Since 2012, the Cats have lost the clearance count by nine per game against Gold Coast, which is ranked last against the Suns in this time. Gold Coast is ranked first for defensive half tackles per game, but ranked last for forward half tackles per game. Despite this, the Suns are ranked 8th for forward half intercepts, and first for scores from forward half intercepts. The Suns have scored from 28 percent of their intercept possessions this season, which is the highest percentage of any side. Welcome to Simonds Stadium for the Geelong Cats v Gold Coast Suns Round 6 clash. GEELONG has taken advantage of an injury-depleted Gold Coast to record a percentage-boosting win at Simonds Stadium on Saturday night. After taking a 14-point lead into quarter-time, Geelong dominated to thrash the Suns by 120 points, kicking 25.18 (168) to Gold Coast 7.6 (48). It was the Cats' first 100-point win since round 18, 2013 and the Suns' first loss by more than 100 points since round 14, 2012. 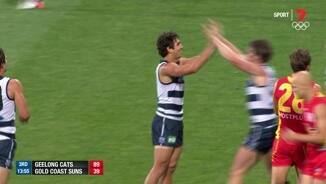 It was also the Cats' highest score since round 20, 2011 when they defeated the Suns at home by 150 points. The win moves Geelong to second place on the ladder ahead of a crucial clash against West Coast next Saturday afternoon and leaves Gold Coast languishing after three successive losses. The Suns were overwhelmed and had too few contributors, with seven players managing few than 10 disposals (not including the injured Trent McKenzie). Their skipper Gary Ablett finished with 25 disposals in his second return to his former home. 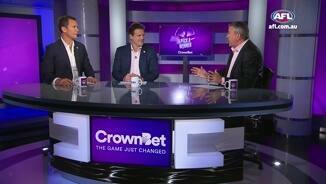 "From about 10 minutes into the second quarter onwards it was just appalling, just not acceptable. 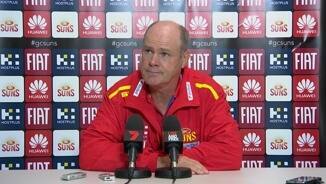 It was embarrassing," a frustrated Rodney Eade said in relation to the dismal performance by his team. "The effort just dropped away and that's not acceptable." "You can always lose. We made a lot of mistakes but by the same token we were beaten at the contest, we were beaten at the centre bounces, the ball was stripped away from us, the lack of run defensively was poor." The Cats kicked 10.8 (68) without the Suns scoring from the first minute of the second half until nine minutes into the final quarter. Patrick Dangerfield dominated with 30 disposals, many of them accompanied by his trademark runs through the midfield. He received good support from Josh Caddy (31 disposals), Mitch Duncan (27), Joel Selwood (32), Steven Motlop (23) and big Tom Hawkins crashed packs to finish with four goals, as did his sidekick Shane Kersten with a career-best tally. Hawkins took eight marks inside the forward 50. "We're a long way from being settled on what our best 22 is, in fact we don't really have a best 22," Chris Scott said in his post-match press conference. "We weren't exactly sure how we were going to work (Daniel) Menzel and Kersten and (Nathan) Vardy and Stanley, those guys, (Lincoln) McCarthy hasn't played much footy, all into our forward line at the same time. "We've said a few times we're not really settled on our forward group, it's probably the area where we're the most unstable if you like," Scott said. Geelong's pressure inside its forward 50 was very good, forcing the Suns to turn the ball over in their back half. It was also careful in the way it used the ball out of its back half, denying the Suns chances to counter-attack. With key defenders Steven May and Rory Thompson missing through suspension and injury respectively, the Cats dominated taking nine marks inside their forward 50 in the second quarter and finishing the game with 25. 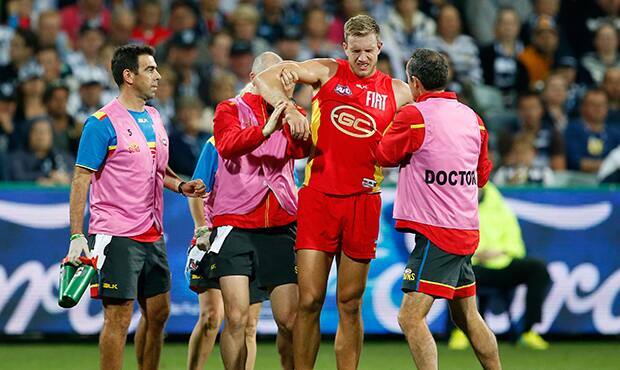 The Suns' problems were accentuated when McKenzie rolled his ankle and Sam Day hurt his back in a marking contest and was off the ground for 10 minutes. By three-quarter-time with the margin 83 points, Gold Coast experimented, moving key forward Tom Lynch into the middle for the centre bounce and small defender Jarrod Harbrow inside the Suns' forward 50. They cannot afford further injuries after losing Adam Saad and Michael Rischitelli this week and with Jaeger O'Meara and David Swallow yet to play in 2016. Trent McKenzie rolled his left ankle early in the second quarter and did not reappear. 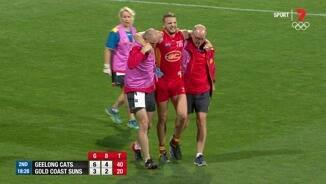 He adds to the growing list of injuries at the Suns while Sam Day battled hard despite hurting his back in the second quarter. Geelong lost Rhys Stanley to illness and Andrew Mackie through general soreness before the game with Nathan Vardy and Darcy Lang replacing the pair. Geelong host West Coast in a vital game for both teams. The Cats will need to stamp their premiership credentials while the Eagles will want to silence the critics who suspect they can't defeat good teams away from home. Gold Coast have a chance to get back on the horse against Melbourne with a home game they should win if they are realistic about making the final eight.